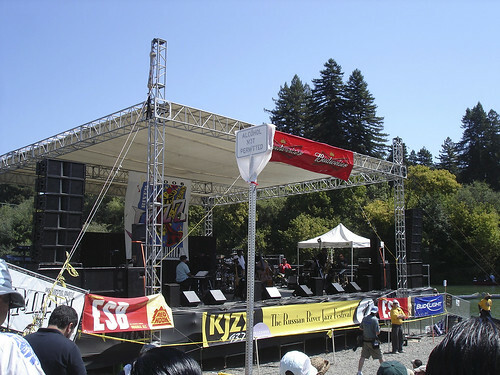 The 2007 Russian River Jazz Festival celebrates 31 years of bringing world-class music and festival revelry to the Bay Area on Saturday and Sunday, September 8 and 9, at Johnson’s Beach in Guerneville. Established in 1976, the Russian River Jazz Festival has evolved into one of the nation’s top jazz events, and the quintessential end-of-Summer celebration for Northern Californians. Enjoy great music and the finest local wines at a picturesque outdoor setting on the banks of the Russian River. Saturday, September 8 and Sunday, September 9, 2007. Gates opens 10:00 a.m. Music begins 11:00 a.m. and runs until 6 p.m.
Gold Tier tickets are available for $90 per day or $170 for both days. Gold Tier guests are assigned a reserved sand chair in front of the main stage, use of a private beach chair and 3 wine tasting coupons. • Children 10 and under are free! Tickets can be purchased by phone by calling the Jazz on the River Box Office at (707) 869-1595; or online at www.RussianRiverFestivals.com. For full artist bios and electronic photos, contact Denise Lamott at lamoore1@verizon.net. No glass, cans, alcohol, pets or high-back beach chairs will be permitted. Low-back chairs only (no higher than 32” in full upright position). This entry was posted on Saturday, August 25th, 2007 at 12:09 am. It is filed under Jazz on the River, Music News/Info and tagged with Boney James, Chaka Khan, Forte, Guerneville, jazz, Jazz on the River, Joe Sample, Johnson Beach, Lavay Smith, Ledisi, live music, Michaele, Norman Brown, Poncho Sanchez, r&b, Russian River Jazz Festival. You can follow any responses to this entry through the RSS 2.0 feed.